I have been wanting to visit MIHO for the longest time ever. I have only heard good things about their food. I finally had the opportunity to visit them in South Park outside the Whistlestop Bar with my friend, J, and my son, on a cool, Friday evening in November. I watched as the staff quickly prepped inside the truck and one of them hung up a string of lights on the outside for that holiday feel (but then again, they probably always do that at night). Here is the menu of what items they offered this evening. You can read the descriptions of these items on their website -- it is nice that they have an archive of what they have served since their menu changes weekly. 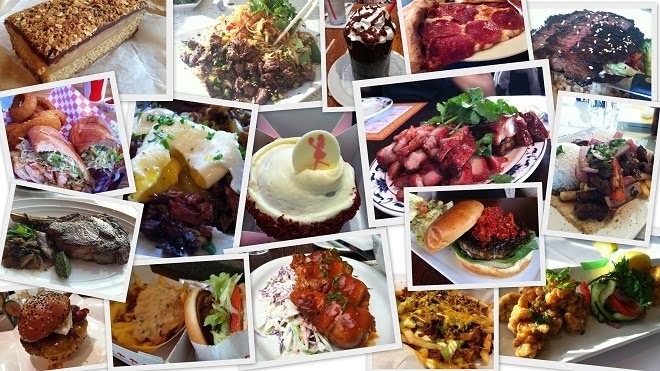 Warning: These pictures do *not* do justice. It was dark and I dislike the flash on my cell phone. Bleh. 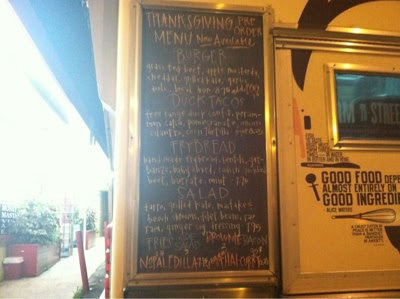 I wanted to experience something different, because I always crave a good burger, and ordered the duck tacos ($8.25). What caught my eye is the duck confit... mmmm. The three tacos that came in one order were small -- street taco size. 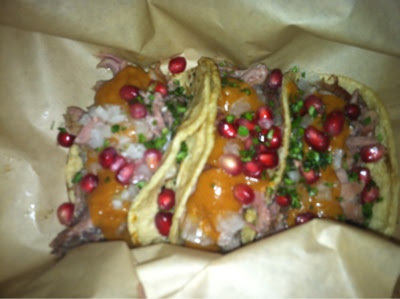 The juicy shredded duck meat on a corn tortilla, was topped with a persimmon salsa, traditional chopped onions and cilantro (for a street taco), and the pomegranate seeds. The meat was succulent and sweet. The salsa had a very mild flavor... it is hard to describe how a persimmon tastes since I don't eat a lot of them. It was silky smooth and did not have any persimmon chunks in it. I liked the flavor combination of the sweet duck meat and crunchy onions/cilantro mix because it was a familiar bite for a street taco. The pomegranates were not my favorite. After a few bites, I ended up picking them out of the other tacos. They had an interesting texture in my mouth and I was like, "Sorry, seeds, I'm done." J ordered the burger ($8.75). I love that every week, MIHO puts out a different type of burger. LOVE it. This week, the grass fed beef burger had grilled local kale, local apple mostarda (had to look this one up), garlic aioli, Spring Hill cheddar, on a soft brioche bun. J added bacon too. YUM! I had a bite and it was really, really yummy. 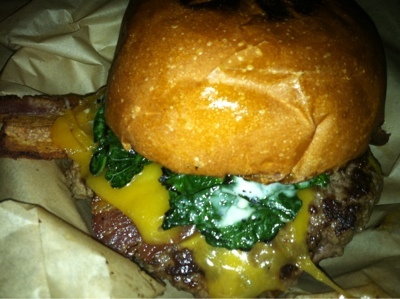 The grilled kale, to me, made the burger. It was similar to having sweet sauteed spinach along with the high quality beef. She won. I should have gotten the burger. We did not have their fries either - we were trying to be good, I guess. But, now I wish we had! 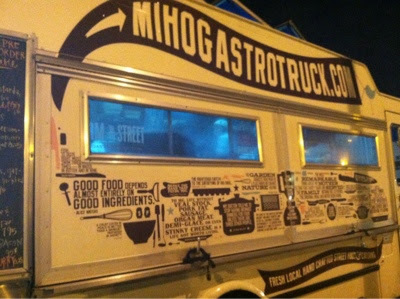 Regardless, the MIHO Gastrotruck is a gem that serves local ingredients and really excellent food. Catch 'em while you can. There is a constant -- they will always be at the Whistlestop Bar in South Park on Friday nights. OHHHH - the tacos and burger look soooo good!! 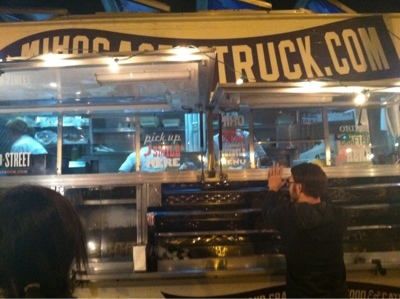 I haven't tried out their food truck yet so will have to make the time to try out this place. Definitely worth a visit, Faye! :) They are pretty creative with their flavors.